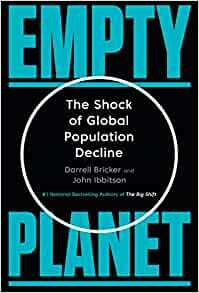 Empty Planet: The Shock of Global Population Decline could upend our thinking about our future of planet Earth with far reaching implications for policy on climate change, immigration and border control, defence, education, child care, and jobs, to name just a few. In the face of Hollywood’s habitual dystopianism we have become inculcated with familiar mantras: we are facing a global population crisis, humans are a plague on the planet, we are poisoning the Earth and so on. These population mantras are wrong. Not just wrong; diametrically wrong, according to the book’s Canadian authors, Darrell Bricker, CEO of Ipsos Public Affairs, and journalist, John Ibbitson. They say, “We do not face the challenge of a population bomb but a population bust”. Yvonne is the principled young widow of the local police chief who was killed in the line of duty. Each night she puts their young son to sleep with tales of his daring and bravery, and so naturally Yvonne is horrified to learn that her husband was not the embodiment of virtue as she had been led to believe-an innocent man named Antoine, has spent eight years falsely imprisoned as a result of his corruption! Yvonne decides to do everything she can to help return the hapless parolee to his regular life and devoted fiancé. Unfortunately, Antoine has trouble adjusting back to society, and soon blows a fuse that leads to an hilarious trail of destruction, where moral, social and romantic obligations are put to the test in a spectacular way. David is a carefree 20-something in the throes of a new romance with Lena, and lives a carefree life until an incident abruptly forces him to assume the guardianship of his seven-year-old niece, Amanda. Alexandre lives in Lyon with his wife and children. One day, quite by chance, he discovers that the priest who abused him when he was a member of a boy scout troop is still working with children. Determined to see justice served, Alexandre re-establishes contact with his boyhood friends – also victims of the same priest – François and Emmanuel. The men vow to ‘lift the burden of silence’. However, as the institutional weight and power of the Catholic Church bears down on this defiant group of survivors determined to tell their story, no one is left unscathed. Two decades after its filming, Olivier Meyrou’s controversial yet exquisitely drawn portrait of France’s last great fashion designer, Yves Saint Laurent, has finally seen the light of day, having previously been withheld from release by Saint Laurent’s business partner, Pierre Bergé. Echoing its ambiguous title, Celebration goes behind-the-scenes to present both Yves the Legend and Yves the Man, as he prepares his final collection before the fashion house was sold to Gucci in 1999. Icons of the glamour industry and the many top models who have donned Saint Laurent’s gowns – show their unerring dedication to the fashion house and its namesake. And then there’s Yves himself – on the one hand, larger than life and, on the other, astonishingly reclusive, irritable and even inelegant. When is a conversation not a conversation? When it’s a political conversation. It looks like liberal democracy is falling apart. But we can put it back together if we take democracy seriously enough—as seriously as the ancient Greeks. The chaos of Donald Trump was unimaginable just a decade ago. Brexit was a similar humiliation for Britain’s political class, leading to its bewildered paralysis ever since. How do such things happen? Perhaps because I admire economists’ deployment of very simple ideas to powerful effect, I’ve come to an approach to these problems that I think is simple and compelling. First, democracy is government by conversation. A political conversation should often be competitive—to sharpen ideas and measure their support. Yet, to remain a conversation rather than a parody of one, it must also be a co-operative search, if not for agreement, then at least for mutual understanding of where positions differ. However, this co-operative foundation for our politics has been largely extinguished by the weaponisation of political communication by professionals operating on the mass media, and, more recently by “trolling” on social media. Second, where elections bake competition into the operating system of representation, there’s another, even more time honoured way to represent the people. The ancient Greeks built their democracy around it and it hides in plain sight today whenever a jury is empanelled in a court of law. And, whether it concerns legal or political matters, deliberation within such bodies nurtures the collaborative aspects of conversation. Giving citizens’ juries and assemblies chosen by lot a role within our beleaguered democracy could see it renewed. To become a politician you compete for election. You then join party colleagues competing against their opponents. Yet democracy implies limits to competition. We remain safe for now that no substantial political grouping perpetuates extra-legal violence. Yet something more fundamental is afoot. For those of you in Melbourne, I thought I’d let you know of a public lecture I’m giving on Thursday night this coming week details below. If you’d like to come, make your free reservation on this page. At elite and popular levels, we think markets provide private goods competitively and governments provide public goods like streets and street lights collectively. But, as the eighteenth-century founder of modern economics Adam Smith understood, the real story is much richer. Any social artefact of any sophistication from a conversation to a smart phone to a city is an ecology of competitive and collaborative elements at numerous levels within the system. This lecture will explore the landscape of the private and the shared in the 21st century. Digital collaboration is burgeoning as with open source software whilst in the ‘analogue’ world, the public good of our social fabric is coming under immense pressure. The lecture will seek new ways of understanding these things to help build the world we want. About a year ago my wife Eva and a friend of hers, Danny Finley started working on a program designed to tackle loneliness through intergenerational contact. Kids are paired with older people in their community through contact between schools and aged care institutions. This is all developed with local communities, the first cab off the rank being Shepparton. A range of activities are ensuing, including story telling leading to the building of online oral histories, the teaching of recipes and cooking, dancing and the ‘reverse mentoring’ of computer literacy. It’s origin in the first of these initiatives is captured in Danny’s fantastic name for it – I Wish I’d Asked. There’s growing enthusiasm from local institutions including Rotary, the local council and Latrobe Uni which has a campus there. I poke a tray of pellets through the door and close it again tell it I run a soup kitchen not an adoption agency. and the other one Vaucluse. This video was not filmed in Shepparton and has nothing directly to do with I Wish I’d Asked, but it would be fun if it could be brought off!